My daughter Reese was born on December 10, 2005. One of the nurses detected a heart murmur upon examining her after her birth. We were told that it was probably nothing, but we needed to get a few tests run. A tumor was detected in the pumping chamber of her heart. The tumor was very unstable and it obstructed her blood flow. The fear was that the tumor could have broken off and flowed into her aeorta, which would have meant the worst imaginable scenerio. We sought out the help of Children’s Memorial Hospital in Chicago, IL. Her condition was deemed serious enough to require open heart surgery the very next morning. That night I sat up staring at my tiny, new baby, thinking that even though I had only known her for a few days, she made my life so complete. What would I do if something happened to her? Coming to terms with the fact that within hours she would be placed on a bypass machine and her tiny heart repaired was almost too much for me to process. I cried silently as she slept, feeling so lucky to look at her and hold her tiny hand. I kissed her and smelt that wonderful new baby smell. As I looked at her I couldn’t help but think of how unfair this all was. She had no idea what was about to happen, as she slept so contently. Dr.’s Backer and Mavroudis performed open heart surgery on my daughter and successfully removed the tumor the very next morning. That day is a day we will never forget. We felt a fear and helplessness that we have never felt before, but we considered outselves so lucky to have Dr.’s Mavroudis and Backer taking care of our precious little girl. We knew that this intervention was literally saving her life. Without the detection of the tumor, and the subsequent surgery, our outcome would have been drastically different. My husband raced to the PICU unit to see her after her surgery. I walked slowly, as I was warned that she would not look like herself. As I walked into the room I saw that she was lying flat on her back, swollen and still. She was on a ventilator, and she had been purposefully paralyzed to help her to heal calmly and quietly. I asked the nurse to cover her chest, as I could not stand to look at the large cut on her tiny chest. The fact that my daughter needed my support took over and my fear subsided and I went into mommy mode. I stroked her hair, and talked a nd sang to her until she came out of her drug induced sleep. I learned so much from such a new person. My daughter was a natural born fighter, tough as nails. She went through the whole surgery and recovery unbelievably well. The Dr.’s and nurses even called her a “star”. The whole experience was earth shaking, however, we are so grateful that our daughter was able to be diagnosed and treated quickly. 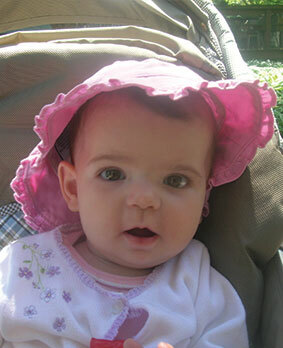 My daughter Reese is living proof that the research and work funded by this organization is literally lifesaving. Nothing is more important, since it has allowed my daughter to live a normal, active, and healthy life. This was an experience that our family will never forget. I am FOREVER grateful for that life saving intervention and the expertise of those two AWESOME surgeons. I love to look at Reese today because you would never know any of that ever happened to us. She has a large scar on her chest, but I see that as her badge of courage. We know that she is a special gift to our family, and she’s a keeper!!! !